Knee injuries are exceptionally common in today’s world. This is really no surprise as people are extremely active well into their advanced years. Unfortunately, our joints are prone to deterioration as we age and the abuse of our bodies in our youth is not as well tolerated in our middle age and senior years. In particular, our knees have a disappointingly high tendency to develop mechanical problems with the shock-absorbing cushion known as the meniscus. The meniscus is a tough, rubbery structure shaped like the letter “C” and is made of fibrocartilage, which can tolerate great stress. There are actually two menisci in each of our knees; an outside (lateral) meniscus and an inside (medical) meniscus and they are positioned between the thighbone (femur) and the shinbone (tibia). The meniscus weakens with age, making the menisci prone to degeneration and tearing. People of older ages often end up with a tear because of a minor injury, such as from the up-and-down motion of squatting. Most often, there isn’t one specific injury to the knee that leads to the “degenerative” type of meniscus tear. These tears of the menisci are commonly seen as a part of the overall condition of osteoarthritis of the knee in older adults and are referred to as “degenerative tears.” More importantly, these degenerative type tears through the middle or non-vascularized areas are not able to be repaired and the damaged sections will generally require removal to resolve the pain. If a tear in the meniscus is small and symptoms resolve in a few weeks, then non-surgical treatment may work well. Unfortunately, a larger tear, particularly the degenerative type, will not heal itself. 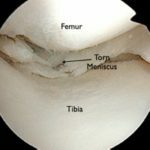 If pain persists after a few weeks with conservative management and an MRI of the knee confirms the presence of a tear in the meniscus, an arthroscopic surgical procedure is a reasonable course of treatment. The repair of a torn meniscus, called a meniscectomy, is one of the most commonly done surgical procedures each year in this country with estimates of over 1 million of these procedures annually. 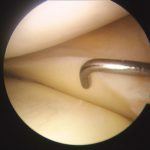 It is performed using a camera on a long fiber optic lens called an arthroscope, which is inserted through small 4mm incisions near the front of your knee. 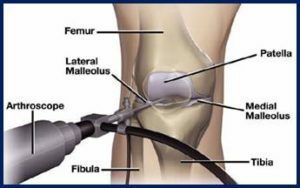 This arthroscope provides a clear view of the inside of your knee. In addition, the actual repair and removal work is done with the aid of a variety of miniature surgical instruments inserted near the arthroscope. Once the surgical resection has been completed, the instruments are removed from the knee, the portals are stitched up and the knee wrapped with a sterile dressing. You are awakened from the anesthesia and taken to the recovery area where the nurses will provide supportive care until you are wide-awake. At this point, you are moved to an area where your family will be waiting for you. Once the anesthesiologist and recovery nurses feel you are fully recovered, you will be allowed to go home with a companion. Ordinarily time elapsed from check-in to departure from the center is about 2.5 to 3 hours. In summary, arthroscopic knee surgery for a torn meniscus is one of the most common orthopedic procedures currently being done, since a torn meniscus is one of the most common joint problems afflicting the middle aged and senior adult population. This surgery has a high success rate in resolving pain and restoring function to your knee.